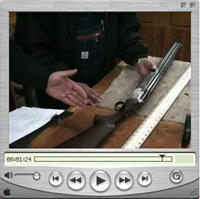 As a build-up to the newsstand debut of the 2006 Gun Test, we're going to be posting a lot of videos shot during the test. This first one is at Jim Carmichel's workshop. Editor-in-chief Todd Smith is narrating, explaining how some elements of the new guns are tested. Look for the complete write-up of the year's best guns in the June/July issue. If it is a VIDEO I kind of expected to SEE something. Heard the whole thing I assume. I think I am interested in these but not to just listen.